Lock in a great price for Aspaki by Art Maisons – rated 9.5 by recent guests! The bed is big and comfortable. 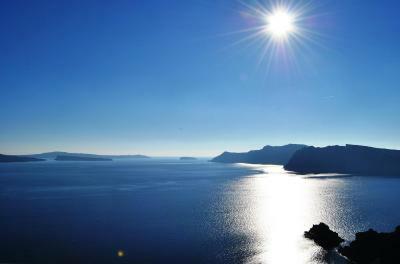 The view of the caldera is beautiful, and the swimming pool inside the room is relaxing and clean. 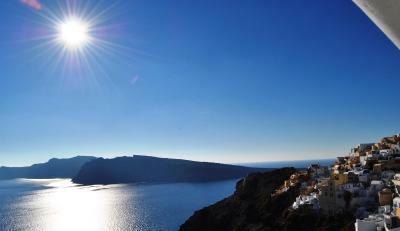 The location was amazing and easy to go to places of Oia. The staff is fantastic and super helpful. The Greek Yogurt for breakfast is delicious. Loved the staff who were so welcoming and helpful. They helped us book boat tours and made great restaurant recommendations. Loved Tereza and her colleague who were so nice, prompt and accommodating. They turned the stay into a great experience. The view from the room was nice. Breakfast was great. Everything here is ineradicable! The hotel staffs are super friendly, breakfast is yummy and fresh, location and private cave pool just perfect. 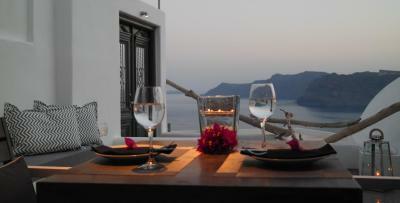 I was there for my honeymoon and stayed at the same hotel for my entire trip in Santorini. Strongly recommended!!! The staff were absolutely amazing and went out of their way to make our stay above one that only , the decerning few will ever experience. 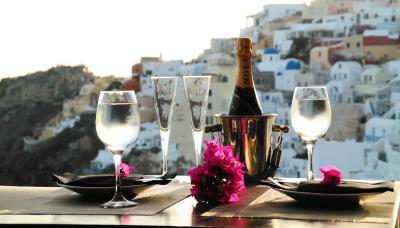 Julie and her girls handled the kitchen, the best restaurant bookings, and a private balcony at Oia castle with champagne. A very romantic stay, we are glad we chose the outdoor tub. The linen were extra soft and above average. Overall you cannot fault the location! 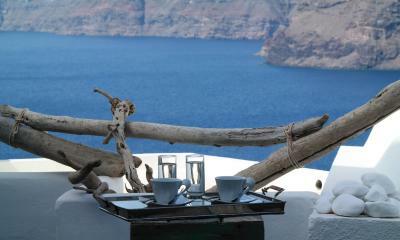 The staff was amazing and very helpful, the view was stunning (and explains why it's very expensive to stay there); the food was wonderful, and if we return to Oia, we will definitely stay there! Amazing experience! 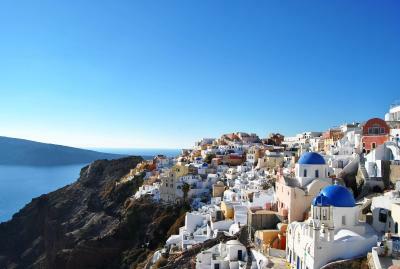 The hotel is gorgeous and is located in the perfect spot in Oia. The staff were incredibly helpful in making our stay perfect :) I can't recommend this hotel enough! Breakfast is super. Hotel is stunning. Staff is so professional and friendly. Room is very nicely decorated, spacious and has all you need. Aspaki by Art Maisons This rating is a reflection of how the property compares to the industry standard when it comes to price, facilities and services available. It's based on a self-evaluation by the property. Use this rating to help choose your stay! 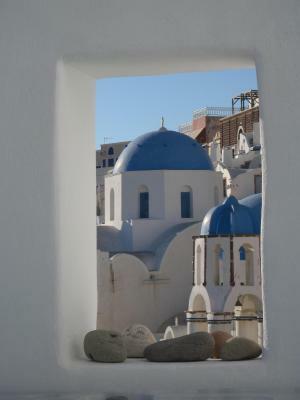 Offering magnificent views to scenic Oia with the blue domes, the Aegean Sea and the volcano, the Cycladic-style Aspaki by Art Maisons Hotel offers elegant suites with free Wi-Fi. It features an outdoor pool, spa center with sauna and a bar. Featuring whitewashed walls, vaulted ceilings and arched entryways, all stylish suites at the Aspaki have a mini bar and coffee machine. Each has a seating area. 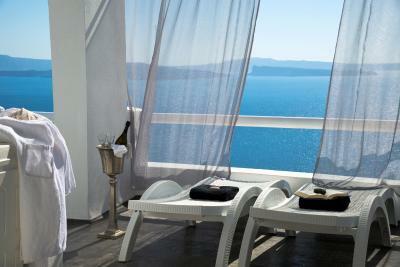 Suites offer an outdoor hot tub with spectacular views or an indoor plunge pool. Some feature a private outdoor pool. 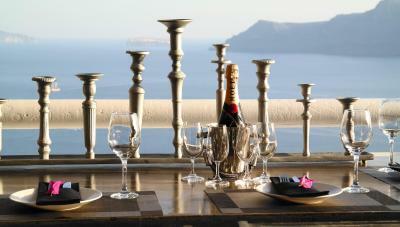 Breakfast is served at the restaurant overlooking amazing views. Drinks, coffee and snacks are served at the on-site bar. Restaurants and shopping district are within a 3-minute walk. Room service is also possible. Wellness facilities include a steam bath and hot tub. Massages can also be arranged. 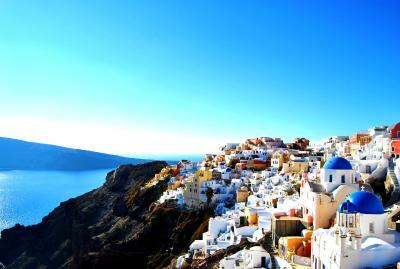 Athinios Port is at 12 mi and Santorini Airport is 11 mi away. The lively Fira is a 15-minute drive. Staff can arrange car rental. 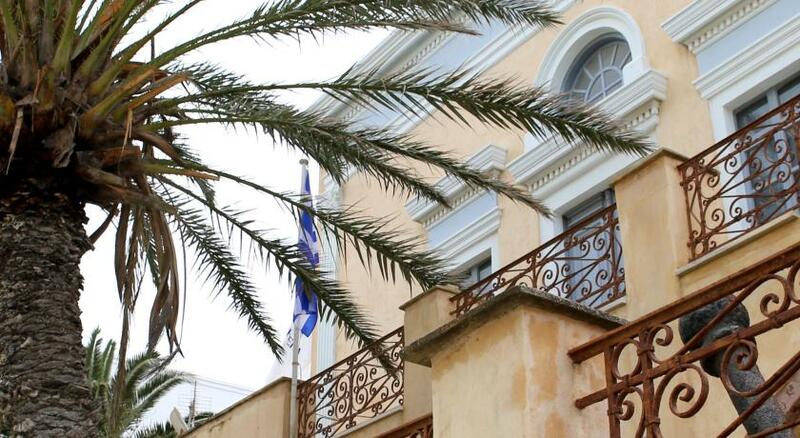 When would you like to stay at Aspaki by Art Maisons? 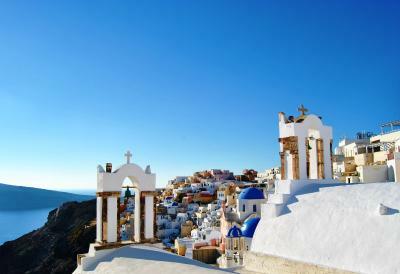 Decorated in warm, soft colors, this suite features balcony with a view of the blue-domed churches and whitewashed cave-style homes hanging from the cliffs. 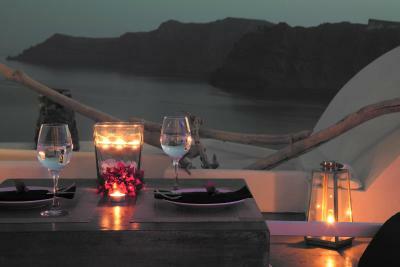 Offers hydro-massage Jacuzzi® in the private balcony with views of the Caldera and the volcano. Features a soothing color palette and eclectic decor. 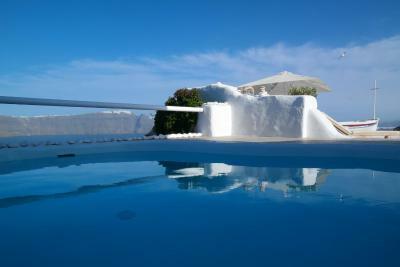 Offers a spacious living area, heated cave swimming pool and balcony with lounge area and views of Caldera, volcano and the scenic village of Oia. Please note that the pool is either indoor or outdoor. 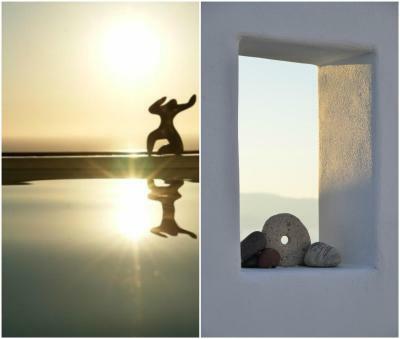 Featuring eclectic design and Cycladic architecture, this suite offers private balconies, panoramic views of the Caldera, the Aegean Sea, the volcano and the scenic Oia. A heated, outdoor Jacuzzi® is provided. House Rules Aspaki by Art Maisons takes special requests – add in the next step! Aspaki by Art Maisons accepts these cards and reserves the right to temporarily hold an amount prior to arrival. Please inform Aspaki by Art Maisons of your expected arrival time in advance. You can use the Special Requests box when booking, or contact the property directly using the contact details in your confirmation. The walk down to this hotel included a pathway area that was extremely popular for tourists, so sometimes it was a bit challenging to go to the hotel, but was also nice once you got through the door, because it was completely private after that. This was the best experience at a hotel I’ve ever had. The location, view, staff, & breakfast (way more than the advertised continental breakfast - hot cooked to order with an “appetizer & dessert” and an amazing view) it was all completely 1st class. I had a family of 4 and we chose the 2 bedroom cave pool option...it was amazing. 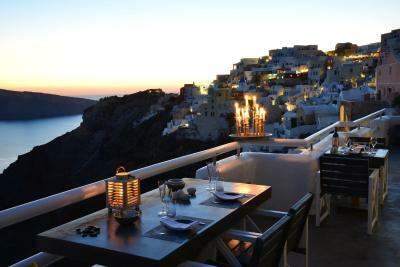 Although just up the steps outside of the hotel you are in the heart of Oia, once you get into the property and make your way down to your cliffside room, it is private and very quiet. 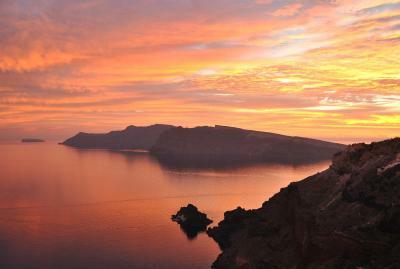 Exactly what we were hoping for on our first trip to Santorini. 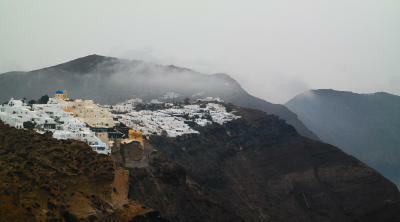 We stayed in Fira our last night and wished we could go back to this hotel! It costs a little more than we initially thought we wanted to spend, but in the end we realized it was WORTH it. 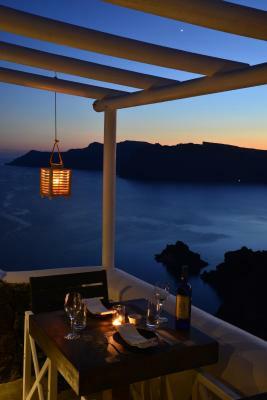 They even setup a private sunset viewing for us at a sister hotel location which was also amazing. My family will never forget this experience. Aside from the amazing location of this accommodation - which is stunning (there were literally tour groups who came down the hotel lane for the view) - the staff was above and beyond in terms of welcoming and hospitable. They made our stay really enjoyable and memorable, having a chat with us each morning at breakfast to see if they could assist us with any plans for the day, sending a porter to find us at a central point when we got lost finding the accomodation as it is really tucked away, and the most relaxed but thorough welcoming orientation complete with colourful cocktail we've ever experienced on arrival as well as chilled bottle of champagne and baklava waiting in our room. Aspaki take care of everything for you and their sister hotel allows you to book in their private balcony with prime position to take in that famous sunset. There are literally hundreds of people above and around you jostling for space, but you get to enjoy it all from a private balcony. Our stay in Aspaki was one of the most memorable accomodations we've ever been too and the most luxurious "cave's" one will ever stay in! I can't speak more highly of this place. 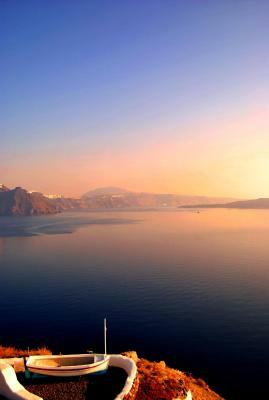 This hotel is absolutely worth the splurge in Santorini. 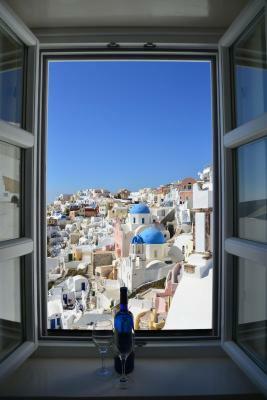 Great room, amazing view, comfortable bed, nice bathrooms, awesome staff, perfect location, did I mention the amazing view? A lot of stairs to enter in the room could make it difficult if you have some accessibility needs. We had greater expectations from the room as the value paid should have at least included transfers to/from port/airport and lunch/dinner. Also the cave pool was not as large as we had hoped. The hotel offered us a free experience to view the sunset at the private terrace located at the castle, which is the best spot for the sunset view. It was really exceptional and memorable. Wonderful views from the room and balcony. Very friendly and helpful staff. Excellent breakfast. 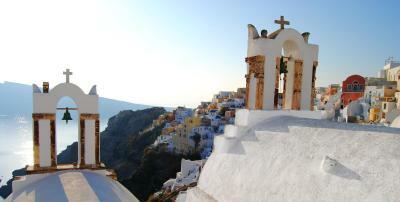 Perfect location in the centre of Oia. 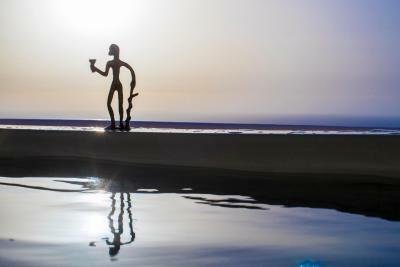 It was an extra bonus to be able to watch the sunset from the terrace of the partner hotel nearby. Everything simply perfect. Cannot expect more than that!!! 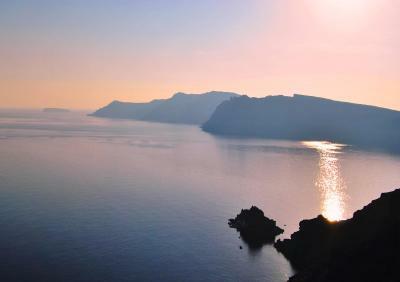 Paradise on earth. Fantastic location. Excellent helpful staff who paid every effort to ensure your comfort. Calm and tranquil. Wonderful views. The property is along a path which everyone seems to want a photo at (which to be fair is an excellent spot), it was just sometimes frustrating to get back to the hotel.